The mayor and the deputy mayor of the city have found a way to be a part of the entire political hullabaloo in the state ahead of the polls for the Srinagar parliamentary seat. Srinagar: With elections for the Srinagar parliamentary seat just around the corner, political tamasha in the state is at its peak. Every day, different ‘mainstream’ parties have been taking pot shots at one another. The mayor and the deputy mayor of the city have also found a way to be a part of the entire hullabaloo. 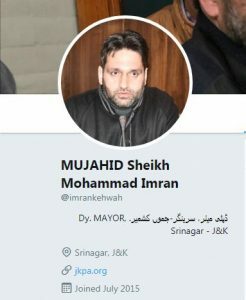 Sheikh Imran, the Congress-backed corporator elected (in an election with single-digit turnout) as Srinagar’s deputy mayor in November last year, decided to prefix the word ‘mujahid’ (one who is engaged in jihad) to his name on Friday on social media. His updated name on his official Twitter, Facebook and other social media accounts thus read ‘MUJAHID’ Sheikh Mohammad Imran. He, however, did not stop there. He then spoke about his decision in a video, asking the youth of Kashmir to use the same prefix before their names as well. “We see that those ruling the country have adopted the prefix ‘chowkidaar’. I request the youth (in Kashmir) that we should answer ‘chowkidaar’ with ‘mujahid’,” he says in the video. “I am a mujahid and I am doing jihad,” he adds. “Mujahid term has been always used in a negative way by the media. I will use the prefix mujahid at every place where my name will be used. We are not terrorists. Mujahid in no way is related to any kind of terrorism,” he said. Imran then made a comparison with Palestine. “Even in Palestine, people vote. PLO (Palestine Liberation Organization) and Hamas are fighting (against Israel) and also contesting elections there. Voting takes place in Pakistan and Azad Kashmir as well,” he says in the video, asking people to vote for the “right party to defeat the communal powers”. Interestingly, the same day Imran campaigned for the “right party”, many corporators of the Srinagar municipality were attending a rally by the J&K Congress president G.A. Mir. 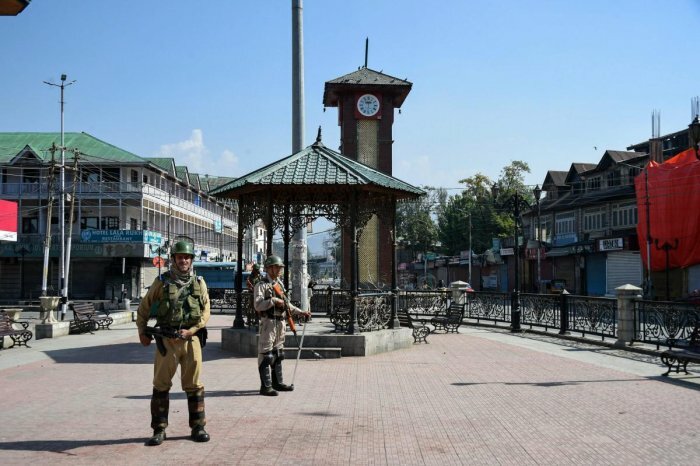 While this report was being filed, Imran sent a message to media persons that he would take his campaign to Ghanta Ghar (the clock tower in city square Lal Chowk) on Sunday afternoon to “teach those shouting in TV debates the real meaning of mujahid and jihad“. Ever since he assumed the office of deputy mayor, Imran has been embroiled in controversies. In fact, he was on the verge of being declared as a wilful defaulter for not paying an outstanding loan of Rs 125 crore. Junaid Azim Mattu, the Srinagar mayor, has also been busy these past few days campaigning for Peoples Conference – of which he is the spokesperson. Mattu also found himself in the spotlight recently for wrong reasons. Last Thursday, Mattu distributed many smartphones among the city corporators at his office in Srinagar. “As a step towards technologically empowering Corporators of SMC to address grievances in a more efficient manner, distributed smartphones among them. The smartphones will be enabled with a special grievance redressal application. Localized redressal!” he tweeted. A day later he received a show cause notice from the District Election Officer for violating the Model Code of Conduct (MCC). 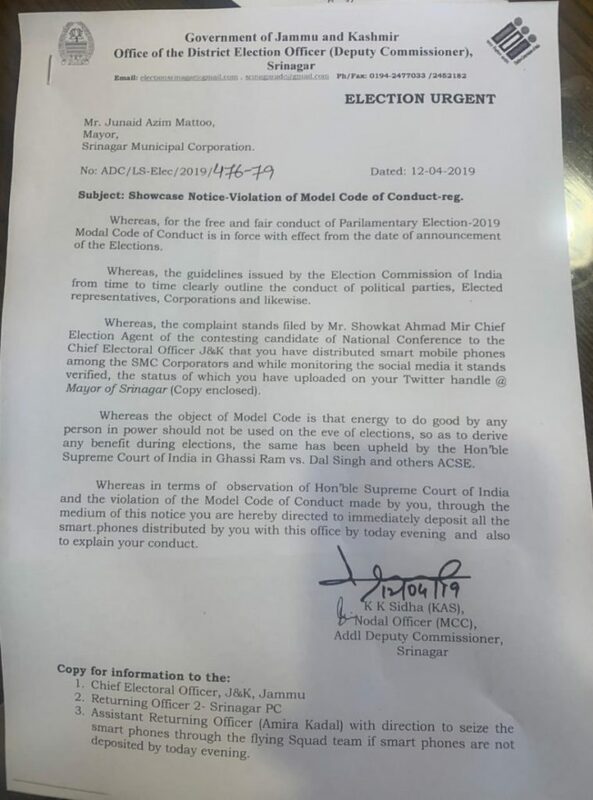 “..the object of Model Code is that energy to do good by any person in power should not be used on the eve of elections, so as to derive any benefit during elections,” read the notice, a copy of which is with The Wire. “You are hereby directed to immediately deposit all the smart phones distributed by you with this office by today (Friday) evening and also explain your conduct,” K.K. Sidha, Additional Deputy Commissioner Srinagar and Nodal Officer MCC, continues. The show cause notice issues by the district election officer. Junaid, however, had not deposited the phones as of Saturday afternoon. “He hasn’t deposited the phones, but has replied to the notice. We are looking into it,” Sidha told The Wire, refusing to share any details about Mattu’s response. “The proceedings are going on. Whatever the outcome will be, you will come to know,” he added. Mattu did not respond to multiple calls and a text message from The Wire. He, however, was quoted saying by a local English daily that the phones distributed among the corporators were “allotted, funding dispensed and procurement made before the code of conduct came into force”. Before switching over to Peoples Conference, Junaid was the National Conference spokesperson. He quit the grand old party of Kashmir to fight the Urban Local Body polls and was elected as Mayor with the support of Peoples Conference and BJP.